The Sunlite Suite interfaces are some of the most versatile and multi-functional of their kind. With four different versions varying from the basic to the first class plus, the user is sure to find exactly what may be needed. The Sunlite Suite products are compatible with an array of different software designed by Nicolaudie. These software include: Sunlite Suite, Sunlite Suite 2, and the Easy Stand Alone 1 and 2. Depending on what the project may call for, the correct software can be selected and downloaded free of charge. With such flexibility, you can rest assured that you will find the proper software no matter what the application may call for. With a robust plastic acrylic construction and high-quality components, the Sunlite Suite interfaces are designed to last. Perfect for live and architectural installations, this is a multi-functional interface that is ready for any job. 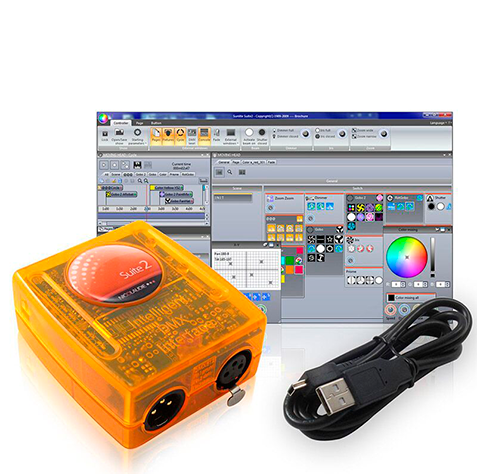 The Sunlite Suite 2 Interface is compatible with many software packages; each with its own page, presets, dynamic movement, and color changing effects that are uniquely built automatically based on its fixture characteristics. The software allows the user to load a console design and link a MIDI, DMX, or EasyRemote controller.